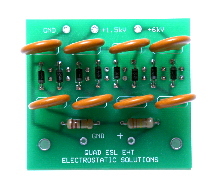 The EHT board produces the necessary 6kV and 1.5kV polarizing voltages for proper operation of the speaker. Boards are supplied with standoffs to retrofit the EHT unit. Reference EHT boards are a cost-effective way to upgrade any Quad ESL. Boards use improved components versus our standard boards and are easily installed in any speaker. 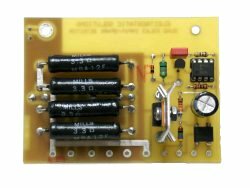 Zener clamp boards are designed to prevent any over voltage condition within the panels and stops stator-to-stator arcing. This is the best way to prevent damage to the delicate tweeter panel during high drive conditions. No ESL as originally delivered from the factory employed zener clamp boards. 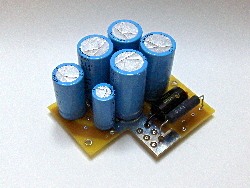 The EHT board produces the necessary 5.25kV polarizing voltage for proper operation of the speaker. In addition, a Dynamic Current Sensing circuit has been employed to enhance performance during high humidity conditions. Reference EHT boards are a cost-effective way to upgrade any Quad ESL63. Boards use improved components versus our standard boards and are easily installed in any speaker. 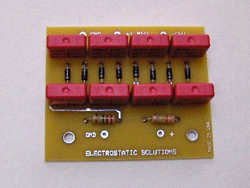 Combination input audio circuit and ionization spark detector board. The spark arrestor shuts down the speaker when internal ionized air levels become too high. 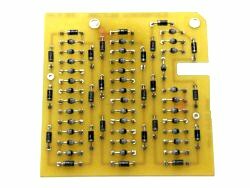 The input circuit provides the necessary audio input transformer load resistors, coupling capacitor. Parts are selected for best sonic performance and include Mills MRA non-inductive wire wound resistors and Sonicap film capacitor for the audio input circuit. Performance of the speaker is enhanced with greater resolution and improved performance at the frequency extremes. Protection circuitry is updated to the latest Quad standard employed in the new 98/05 series of speakers. Zener clamp boards are designed to prevent any over voltage condition within the panels and stops stator-to-stator arcing. 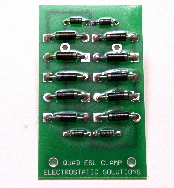 Only late production ESL63 after serial number 29,000 employ zener clamp boards. Updating your ESL63 with the zener clamp board and revised input/spark arrestor boards provides the ESL63 with maximum protection under heavy drive conditions. Boards come with stand-offs and wire to update your speaker. The ESL63 employs an input R/C network consisting of a 220uf non-polarized electrolytic capacitor and 1.5 ohm resistor placed in series with the input of the speaker. We have developed a new printed-circuit board stuffed with high-quality components to replace the stock R/C network. The stock R/C network remains in place and the new board is wired into the audio circuit. 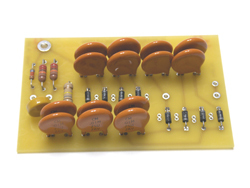 Boards are supplied with Black Gates AC capacitors, Cardas by-pass capacitors and a Mills MRA non-inductive wire wound resistor, Cardas hook-up, and stand-offs/screws to retrofit your ESL63 speaker. 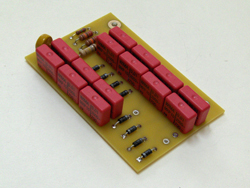 We also supply the board blank for those that wish to stuff their own components for the R/C network. Pricing for all of our boards and services can be found on our pricing page.